I’ve been going out doing Disaster Assessment (DA). There are so many homes affected and or destroyed by the storm. DA is on hold right now due to the snow mix with rain. Based on the data that we collected, upper managements are planning to deliver supply of goodies to those affected areas. Yesterday, I went to eat with my team and our server asked where we were from. One of the teammates told her that we are with Red Cross and the server just broke down and cried. She was very grateful and happy that we were there for her community. She thanked us for leaving our families and friends to come help out. It was such an amazing experience with this disaster response so far. I am so happy and proud to be Red Crosser!!! 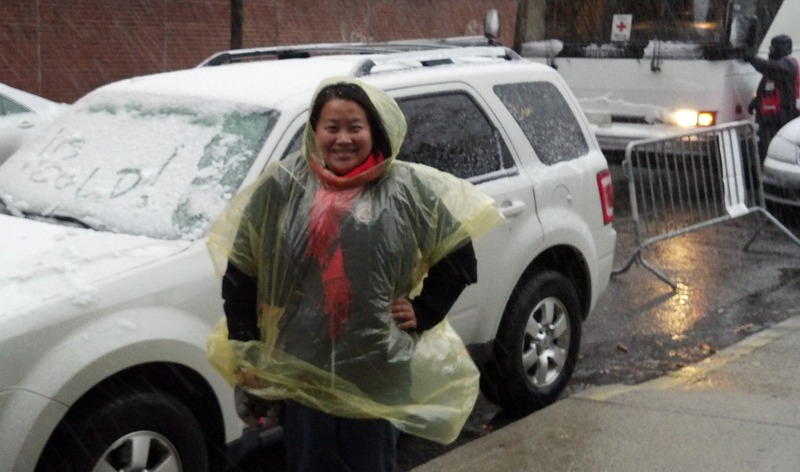 Choua Yang is one of 5,700 or so Red Cross disaster relief workers responding to Superstorm Sandy. (Around 50 are from Minnesota.) 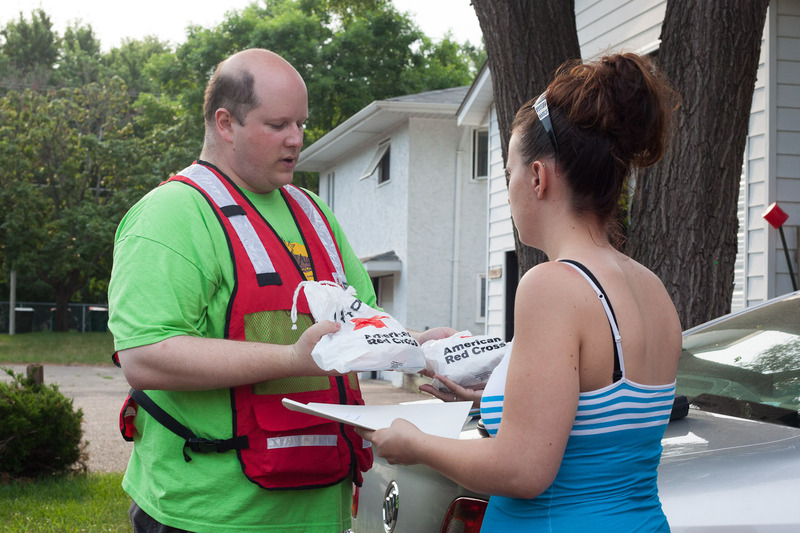 90 percent of Red Cross responders are volunteers. You can help support Red Cross humanitarian disaster relief. 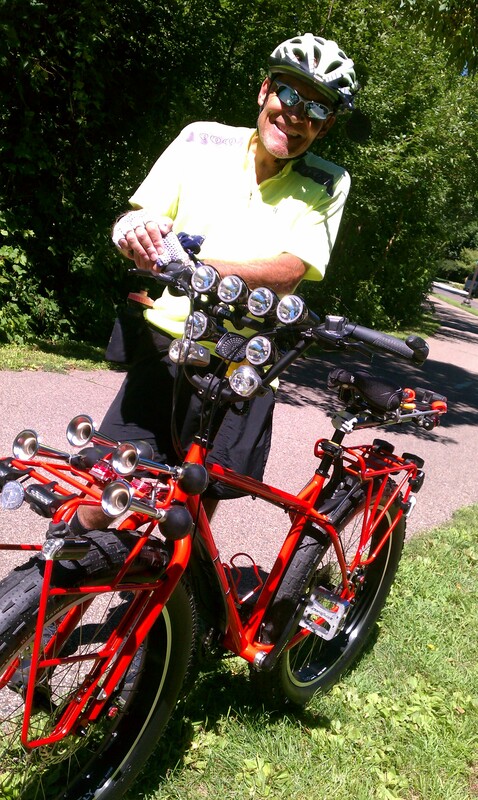 The other day while riding along the Minneapolis Grand Rounds bike path, we stumbled across Blaine Mogren. He loves bikes. He looooooooves bikes. Among the bikes in his collection is this fine (pictured left) Surly Pugsley. He has six of them. This particular one he calls Fire Engine Pugsley. We can see why. For starters, its BRIGHT RED. 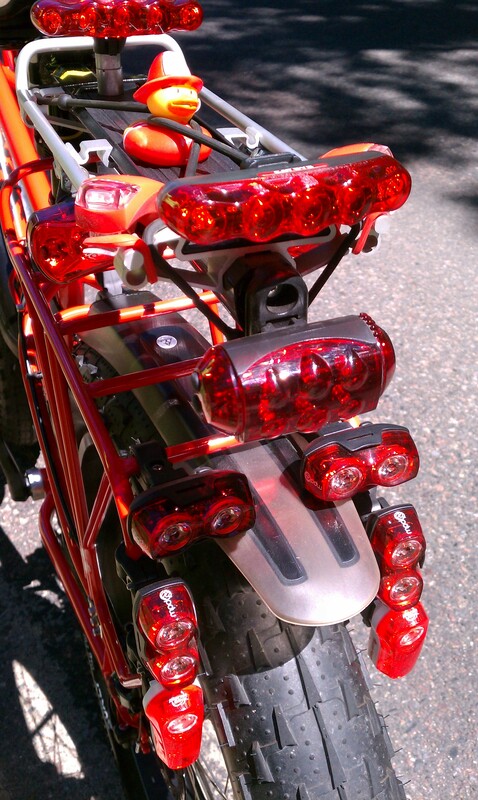 It also has loud horns, flashing lights, and a fire-fighter rubber duck. And crosses, white ones (like on the Swiss flag). After a minute of chit-chat with Blaine this thought emerges: let’s make a Red Cross Pugsley! After all, the Pugsley is (via Wikipedia) revolutionary: In 2005, Surly began selling the Pugsley, the first mass-produced mountain bike with extremely large volume tires, up to 4 inches wide, for deep snow and sand riding. The front and rear wheels share a common hub size and can be interchanged, allowing for additional gearing combinations. Noted bicycle technical authority Sheldon Brown said, “Pugsley is, in its way, as revolutionary as the original mountain bikes were in the early 1980s.” Bicycling Magazine wrote, “It’s not ideal for everyday use, but it can handle a wide variety of demands and conditions well.” Let’s repeat that last bit: a “wide variety of demands and conditions.” Sooooooooo, that could include disaster response in your hometown (or ours where it snows for months except last winter). Tell us, what do you think? What would your Red Cross Pugsley look like? Would it be red with white? Or white with red? Would you have side bags for water and snacks that you would distribute to people affected by disasters or those responding to them? …..
Hudson, Wisconsin resident Nathan Steen was watching TV around 2:30 in the morning, July 5, 2012, when he started to smell an odd, almost chemical-like, smell in his basement apartment. He opened the door to his unit and was shocked to see thick black smoke in the hallway. Running to the fire alarm pull switch in the hallway, he yanked it several times but did not hear the alarm. Nathan couldn’t see flames or the source of the fire, so he went back to his apartment, woke his wife and two children, and called then called 911. He then ran to the other apartments, banging on doors to alert his neighbors to the fire. He was pounding on windows from outside, yelling “Fire!”, when the police arrived and began to assist getting people out from the other 9 units of the building. The other residents report opening their doors to thick black smoke before rushing out of the building. A main concern of all the residents was the failure of the alarms to sound. Nathan Steen was truly a hero to alert everyone to the danger before it spread to other areas of the building. The fire appears to have occurred in a basement storage area, but the incident is under investigation by the Hudson Police Department. 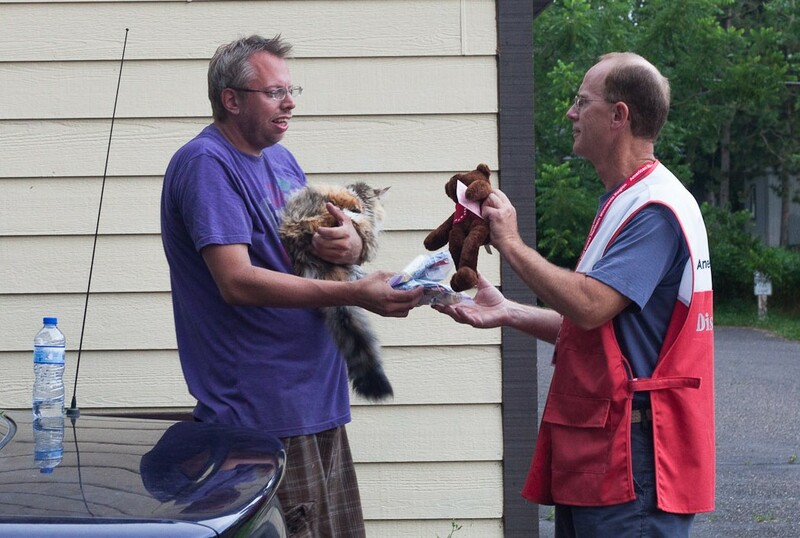 Red Cross volunteer workers Jason Winget and John Trieb assisted residents of the two lower units with emergency disaster relief. They will be able to return to their homes after the smoke damage is cleared. Everyone assisted by the Red Cross was thankful for the help. Kevin Williams, who was displaced by the fire with his mother, said that the Red Cross helped bring relief and comfort to them. 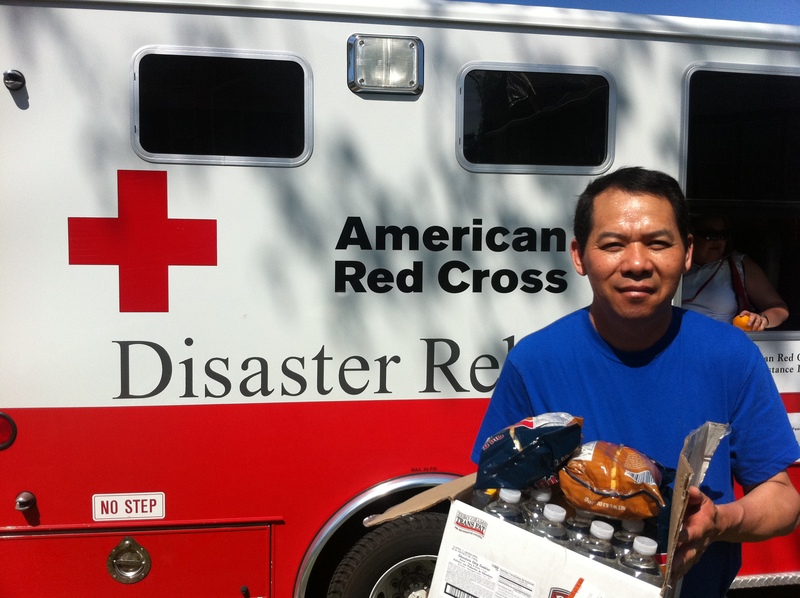 He didn’t know that Red Cross volunteers helped people in situations like this and said that he would consider volunteering himself in the future to help others dealing with disaster from fire. 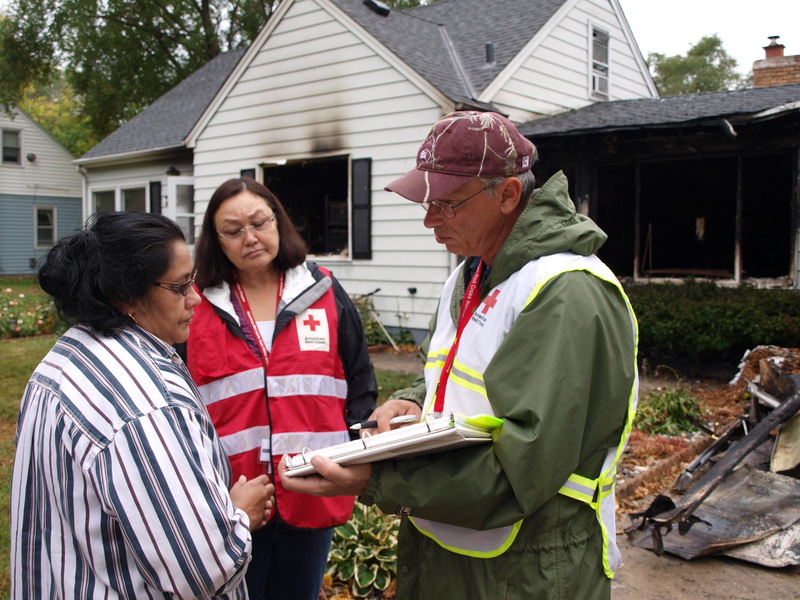 Visit our website redcrossmn.org to learn more about Red Cross services and opportunities. A year ago, May 22, 2011, an EF1 tornado swept through Minneapolis, mostly on the North Side where it ripped up homes and trees, displaced hundreds of our neighbors, killed two people, and injured dozens of others. The American Red Cross responded immediately, providing safe shelter, food, water, and emotional support to survivors. Like others, right now we’re remembering this tragic event. Watch our tribute video. 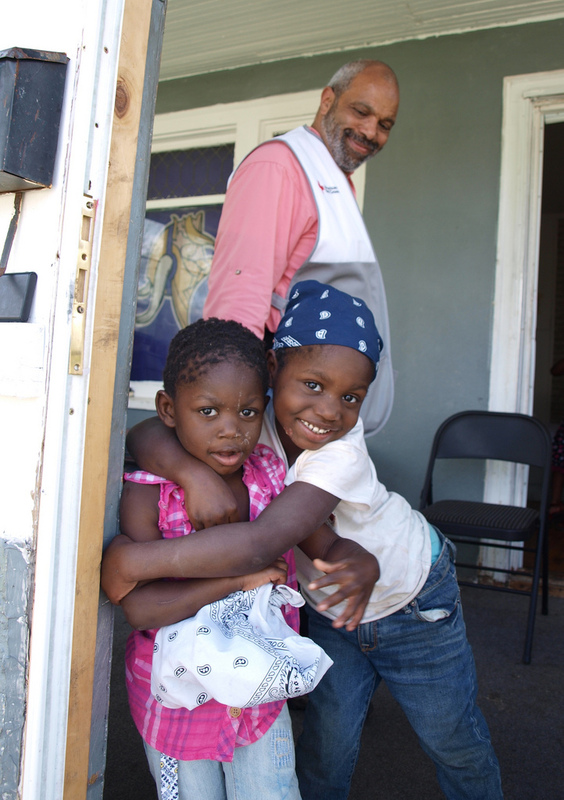 “People often enter a shelter at their lowest point. 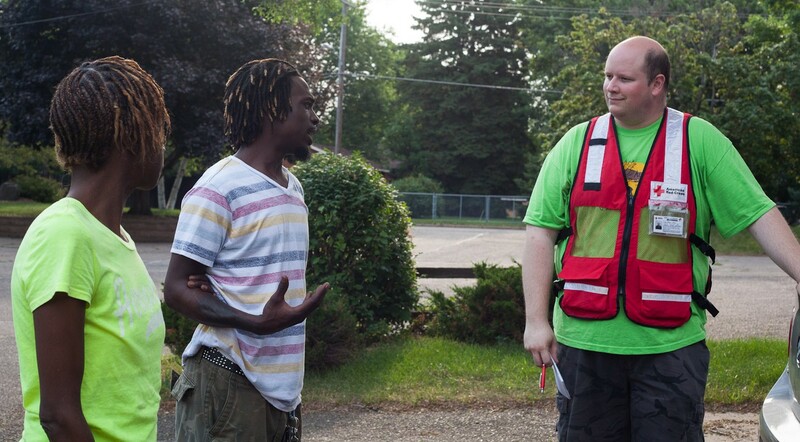 Sometimes that’s really what people need…someone to support them and provide energy they don’t have.” A Red Cross Shelter Worker responding to the Minneapolis tornado that hit May 22, 2011. 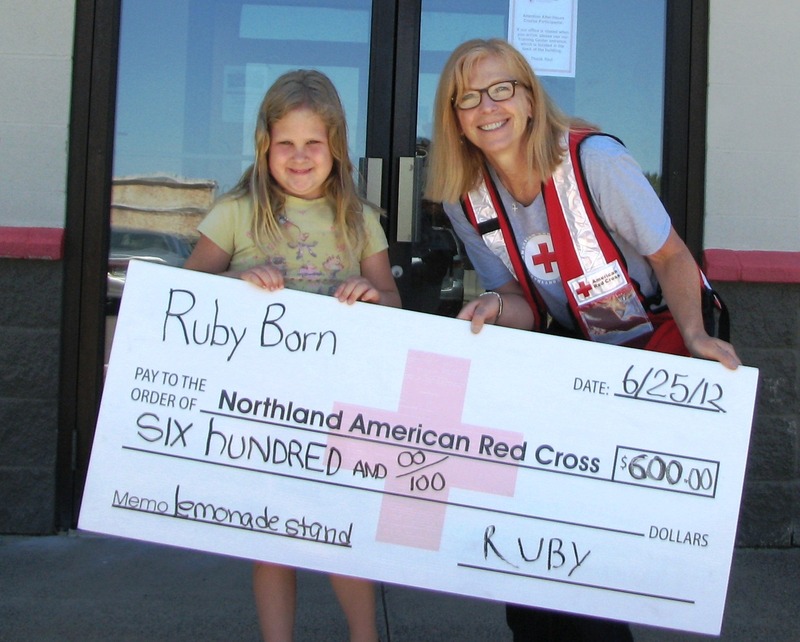 “Thank you Red Cross! 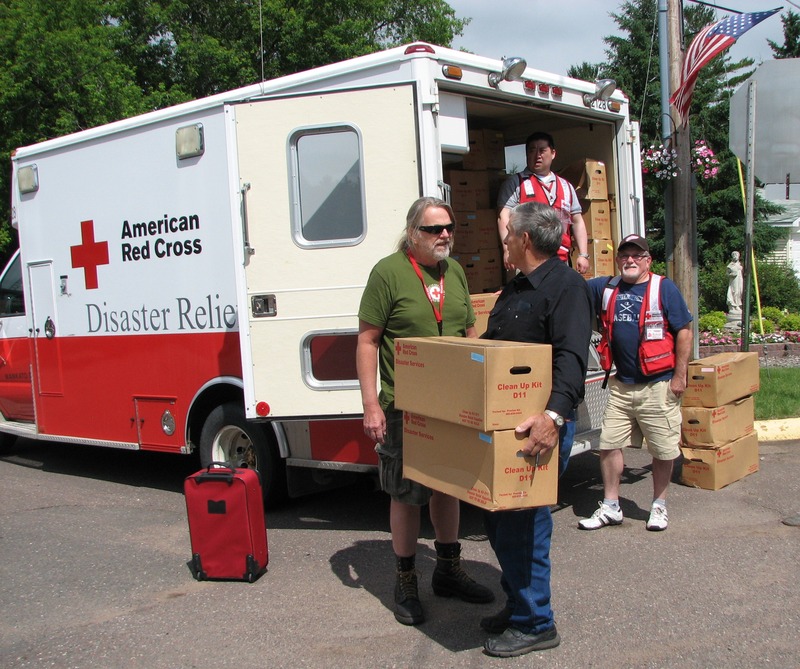 We’re getting what we need thanks to you.” A Minneapolis Tornado Survivor after receiving relief supplies from the Red Cross. 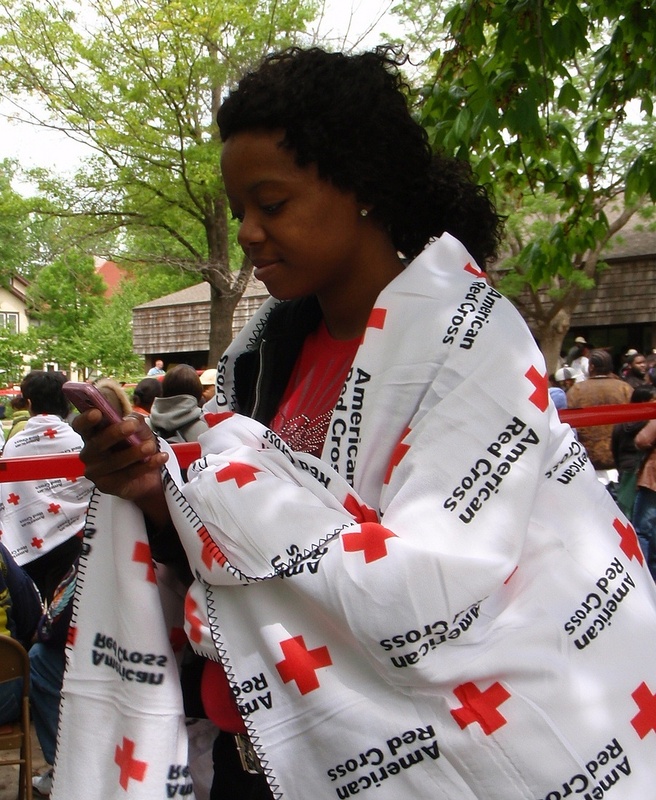 “Without the American Red Cross we would have nowhere to go.” A Tornado Survivor who relied on the Red Cross shelter for many nights after the disaster. 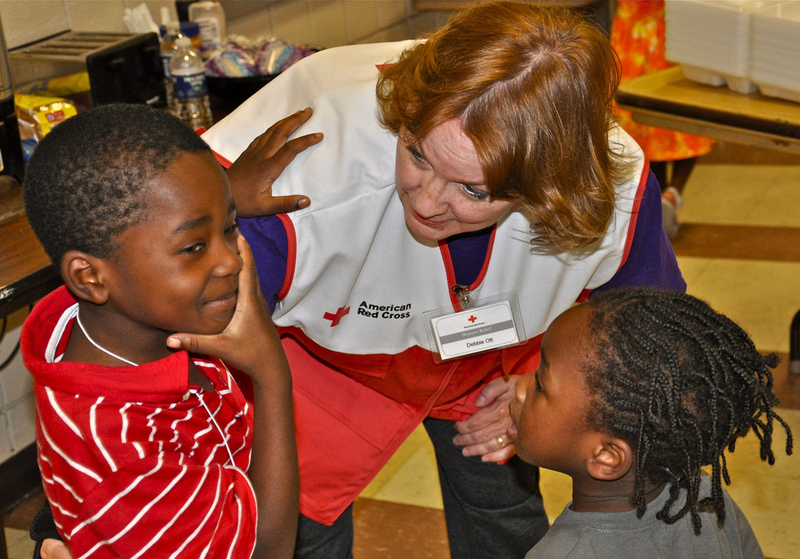 If this post inspires you, consider becoming a part of the Red Cross. There’s a place for everyone. You could give time, money, or blood. 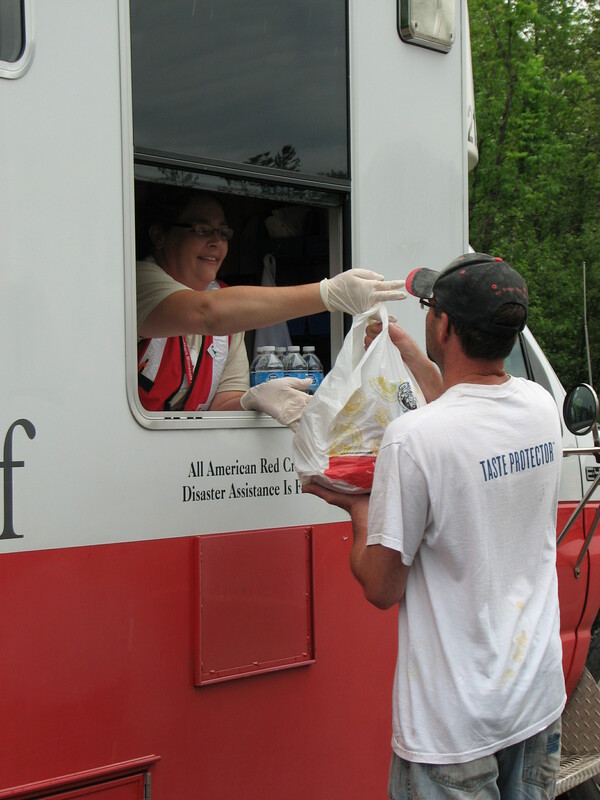 You could help us prepare for the next disaster, tornado, or emergency. You could learn CPR or First Aid. You could provide comfort when people need it the most. Learn more on our website. 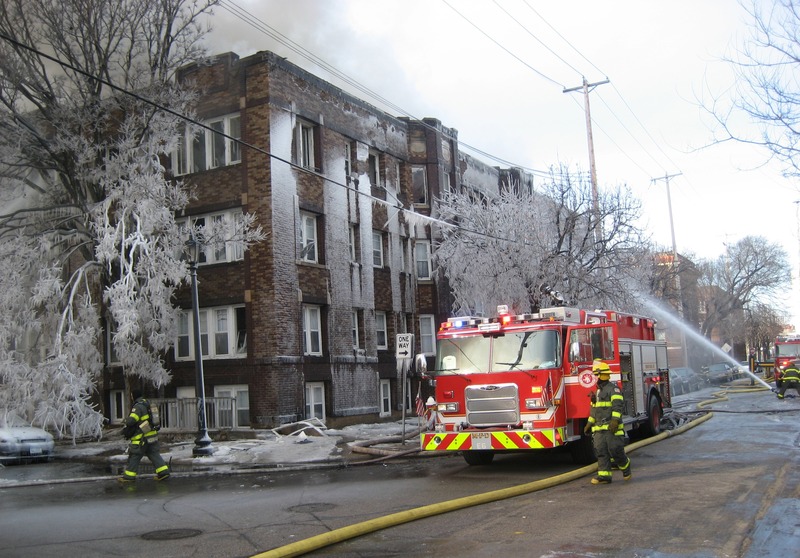 On Friday, March 9, 2012, a fire burned an apartment building in Minneapolis. That afternoon at the Red Cross service center volunteer relief worker Kevin Berger spoke with two people affected by this disaster and learned more about them. They had just gone to bed around 1:45 a.m. when the fire alarms sounded at 2 a.m. Kimberlee said at first they thought it was a false alarm because even as they headed out of the building there was no signs of smoke or fire. However, it wasn’t long before flames rushed through the building and they found themselves meeting up with their neighbors in a bus temporarily used as a shelter. Her boyfriend, Carl Robinsen, was also considering how to move forward. “I’m not worried about what caused this to happen, we just need to fix it.” He said they were thankful that no one was seriously hurt or killed in the building that housed 32 units. “You can’t replace life,” he said. 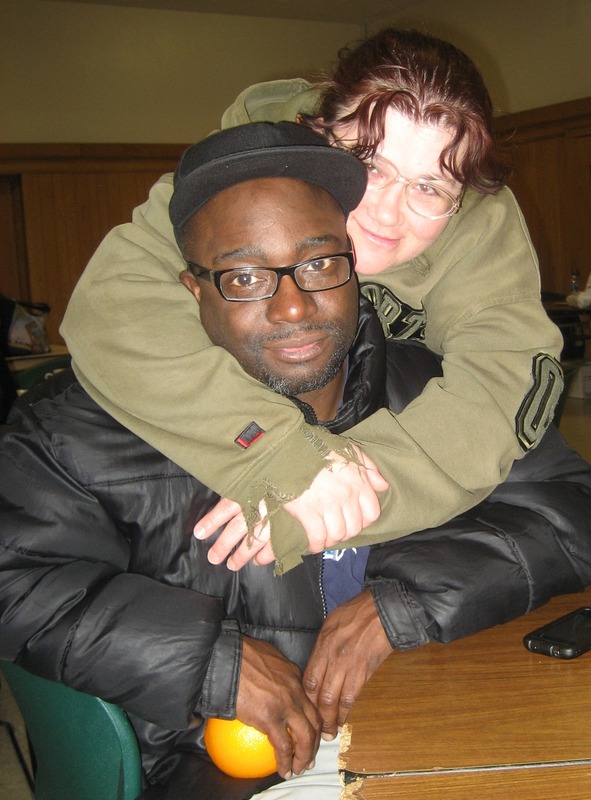 One concern is replacing clippers and shears valued at more than $1500 and needs for the barber program he’s just four months from completing at Minneapolis Community and Technical College (MCTC). 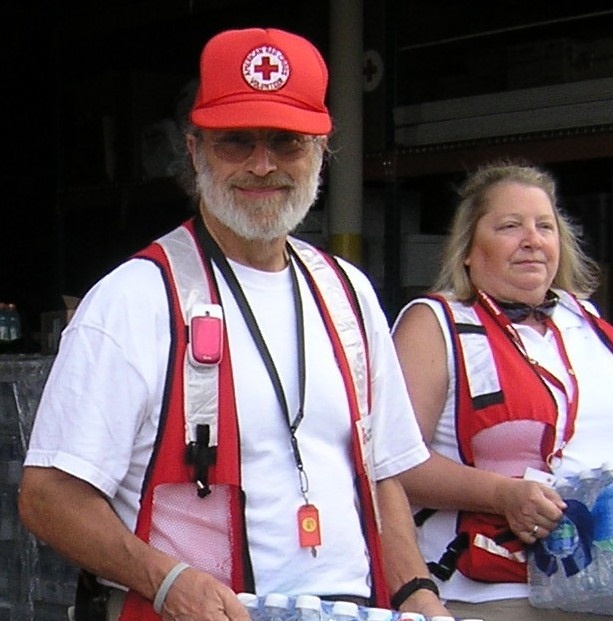 As lunch passed by at the Red Cross service center Robinsen was wondering if he should make his way to his job as a janitor in Edina so that he could at least think about something else for a while. 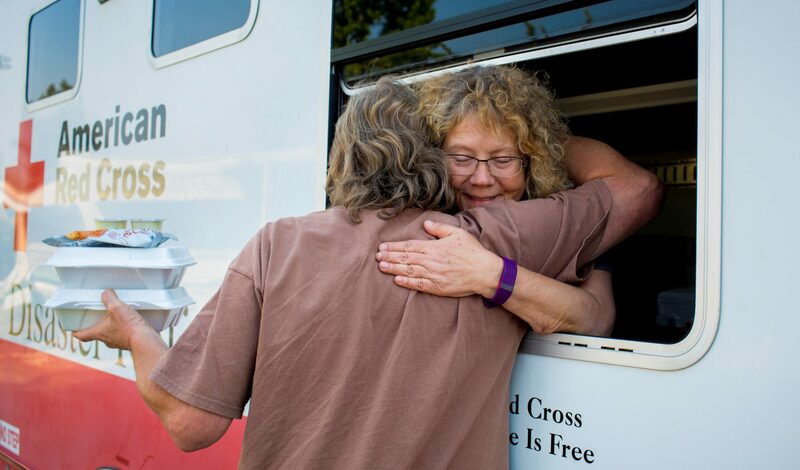 The couple left the service center with information from the Red Cross and The Salvation Army for a temporary place to stay and getting some clothes before finding a new home. Text REDCROSS to 90999 to give $10 to American Red Cross disaster relief, helping people recover from this fire and similar disasters. Or go to redcross.org to donate even more financial support. This story and the accompanying photos are by Kevin Berger, a volunteer American Red Cross disaster relief worker based in Minnesota.